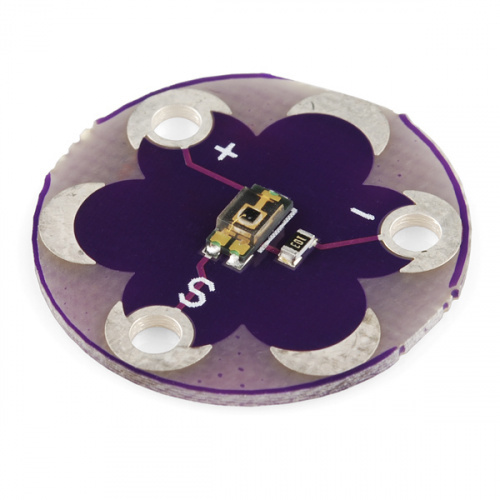 The LilyPad Light Sensor is an e-textile friendly version of the Ambient Light Sensor Breakout. If you've used the breakout in a project before, the hookup and code will be very similar. You will need to connect to a LilyPad Arduino or other microcontroller to read the sensor values and use in your code. This sensor outputs an analog value from 0 to 3.3V. In bright light (full daylight) this sensor will output 3.3V, and if completely covered will output 0V. In a typical indoor lighting situation, the sensor will output from around 1 to 2V. Every electrical project starts with a circuit. Don't know what a circuit is? We're here to help. Light is a useful tool for the electrical engineer. Understanding how light relates to electronics is a fundamental skill for many projects. 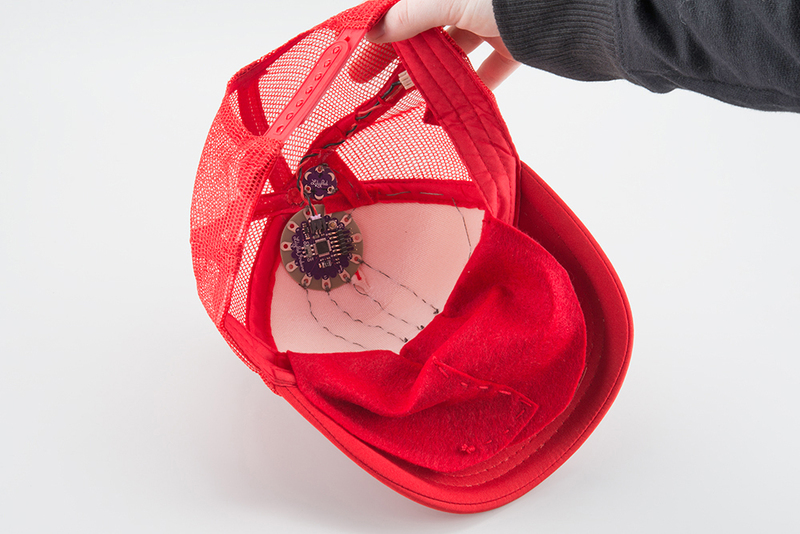 Learn a few different ways to protect your conductive thread and LilyPad components in your next wearables project. Learn how to use conductive thread with LilyPad components. 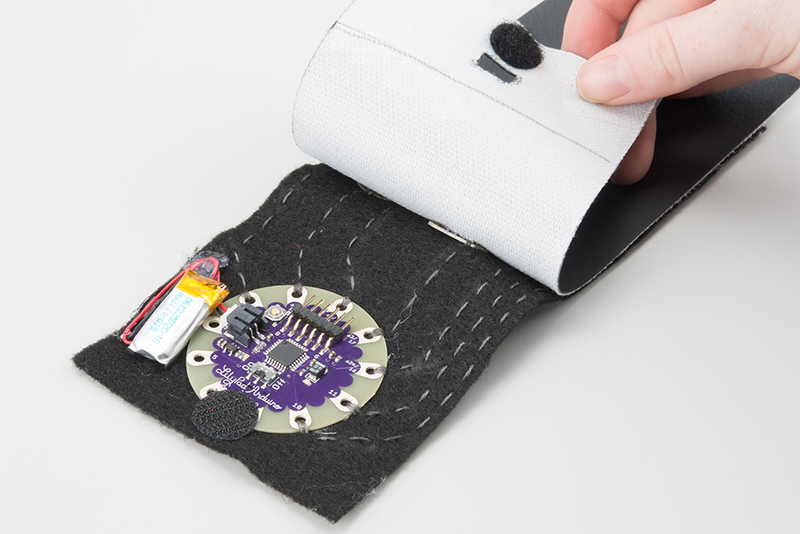 An introduction to the LilyPad ecosystem - a set of sewable electronic pieces designed to help you build soft, sewable, interactive e-textile projects. If you have not used the TEMT6000 light sensor before, we recommend checking out the TEMT6000 Hookup Guide for basic information regarding that sensor. Bring the ability to detect light levels to any project with the SparkFun TEMT6000 Ambient Light Sensor Breakout. 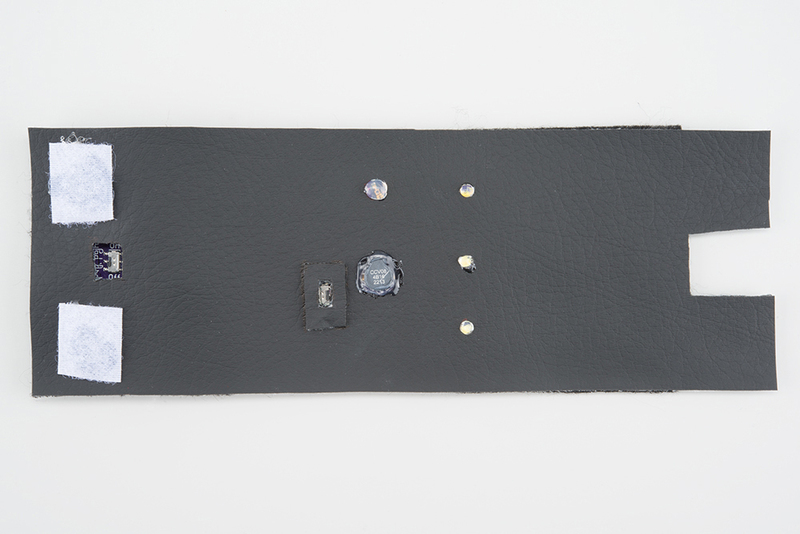 The LilyPad Light Sensor has three sew tabs - Power (+), Ground (-), and Signal (S). The signal tab should be connected to an analog tab (marked with an 'A') on the LilyPad Arduino. 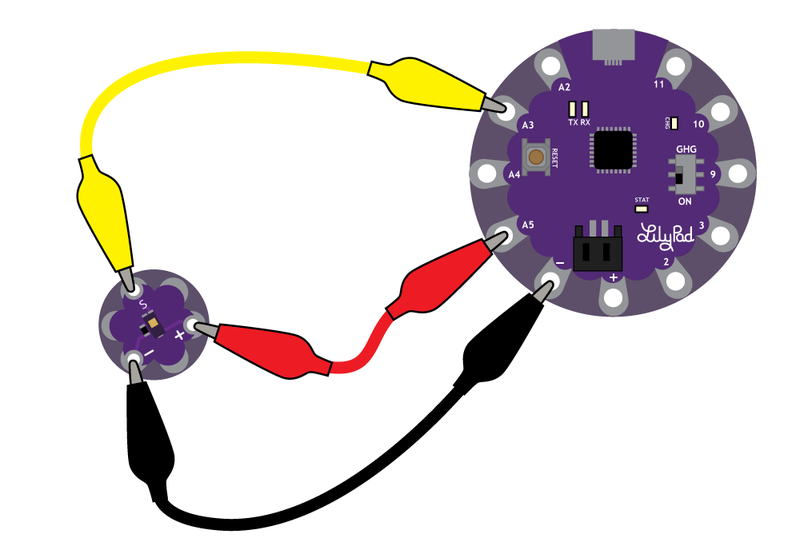 To follow along with the code examples in this tutorial, connect the light sensor to a LilyPad Arduino as shown below. Use alligator clips to temporarily connect Signal to A3 on a LilyPad Arduino, (-) to (-) on the LilyPad, and (+) to A5. When you are finished prototyping, replace the alligator clips with conductive thread traces for permanent installation in your project. To make our diagrams easier to follow, and to avoid any potential short circuits in our stitching, we'll be connecting the Power pin to A5, which we will then set to HIGH in our code. This will act as an additional power attachment. 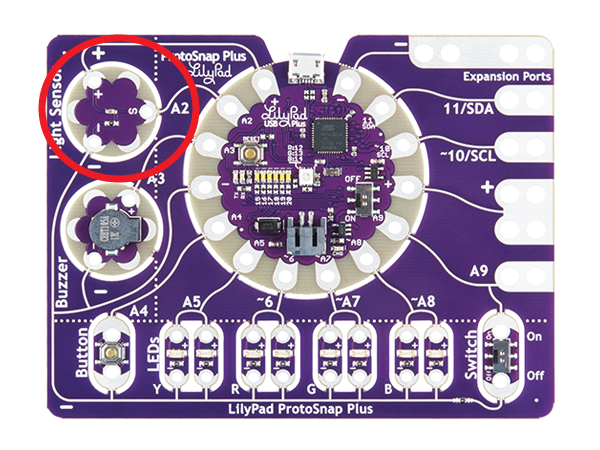 If following along with a LilyPad ProtoSnap Plus, the light sensor is pre-wired to A2. The light sensor on the ProtoSnap is a slightly different version that the catalog item, but functions the same. If using the ProtoSnap - LilyPad Development Simple - attach to the metal tab at the top right of the board, this connects to A3. You can also set pin A5 to HIGH as an additional power tab, as the LilyPad Simple's tab is hard to access in the ProtoSnap format. If using the the pre-wired light sensor on the ProtoSnap - LilyPad Development Board, it is attached to pin A6. After connecting the light sensor, let's take a look at the values it reads under different lighting conditions. For this we'll use analogRead() and Serial.print(). Upload the following code to your LilyPad Arduino, making sure to select the correct LilyPad board from the drop down menu below. Choose LilyPad Arduino USB if using a LilyPad Arduino USB. The LilyPad Arduino Simple, LilyPad Arduino, and LilyPad Development Board, and Development Board Simple all use a LilyPad ATmega 328. Select LilyPad USB Plus if following along with the LilyPad ProtoSnap Plus. Don't forget to select the Serial Port that your LilyPad is connected to. If prototyping with a LilyPad ProtoSnap Plus, change sensorPin to A2. If prototyping with a LilyPad Development Board, change sensorPin to A6. Copy the following code and upload it to your LilyPad. // Initialize Serial, set the baud rate to 9600 bps. // Delay so that the text doesn't scroll too fast on the Serial Monitor. // Adjust to a larger number for a slower scroll. Once your code is uploaded, open the serial terminal in the IDE and see the output. Numbers should begin to stream by. Observe how the numbers change as the ambient light changes. Use your hand to cover the sensor or a flashlight to shine more light on it. Next we'll be using these values to control behaviors in our code. Next, we'll make some decisions in the code based on the light sensor's readings. This example code creates a simple automatic night light that turns on an LED when it’s dark. We'll use the analogRead() function to get data from the light sensor and compare it to a variable we set for darkness level. When the readings from the light sensor fall below our threshold set for dark, it will turn on the LED. You can hook up a LilyPad LED to pin 5 or use the built-in LED attached to pin 13.
an LED will turn on. // The dark variable determines when we turn the LEDs on or off. // Set higher or lower to adjust sensitivity. // Create a variable to hold the readings from the light sensor. // Set which pin the LED is connected to. // Set to 13 if you'd rather use the LilyPad Arduino's built-in LED. else // Otherwise, if "lightValue" is greater than "dark"
// Delay so that the text doesn't scroll to fast on the Serial Monitor. If your light sensor isn't triggering correctly, check the output of the Serial Monitor to see if there's a better value for the dark variable than what is set in the example code. 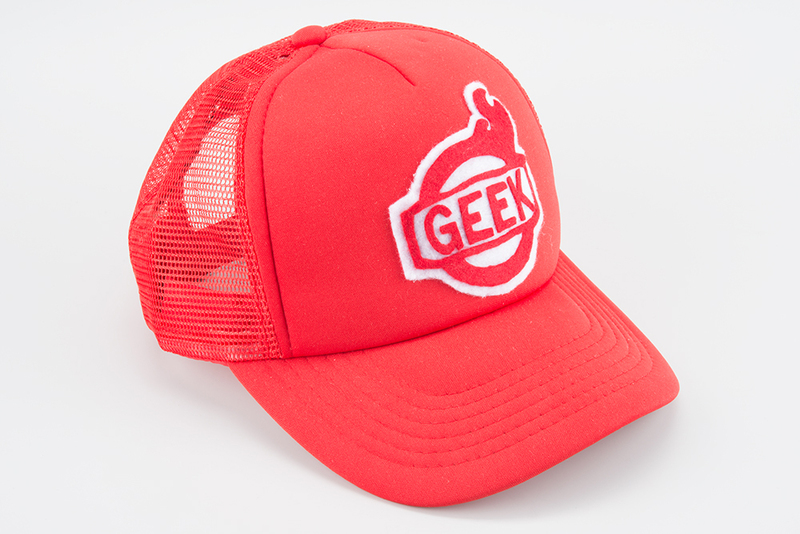 Let your geek shine with this hat that blinks when the lights go down. Combining the sensor with a LilyPad Buzzer can create interesting interactive projects, for example this wearable light-controlled musical instrument or Opto-Theremin. Control tones on the buzzer by covering the LilyPad Light Sensor. This prom dress project featured in this video uses an initial threshold setting and light sensor to trigger some LilyPad Pixel Boards. Create a scarf lights up when it gets dark with LilyPad and sewable LED ribbon. This scarf is embedded with a ribbon of LEDs that illuminate when it gets dark out, making yourself more visible to vehicle and other pedestrians. Or, you can check out these other great light-based tutorials. How about that humidity? This tutorial shows how to add sensing capability to the 21st Century Fashion Kit's RGB flower project. Getting started guide for the Avago APDS-9960 color, proximity, and gesture sensor. All the information you need to use the Spectacle Light Kit in one place. How to hook up the LilyPad Light Sensor as well as some project ideas and example code.